Visually captivating scenes are around every corner of this coastal ride. 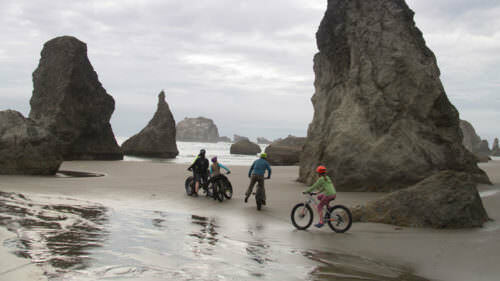 In one afternoon we rode from watching whales from a cliff to exploring a lighthouse to discovering quiet surf breaks. For directions and map details, follow the self-guided Ride with GPS map. To start this adventure, we headed over to Bike Newport. 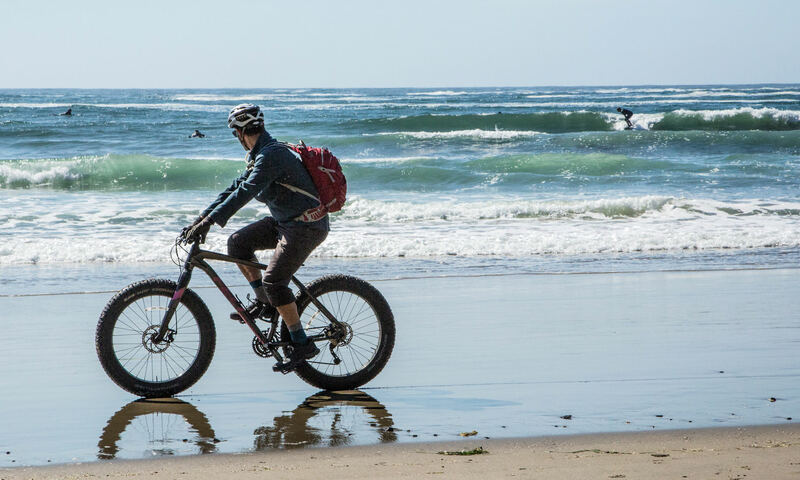 The friendly staff are local experts and have all the intel about fat-biking the Oregon Coast. Before embarking on this journey, it’s important to know which way the wind is blowing. It’s always best to have the wind at your back while riding on the beach, and then ride the road back into the headwind where you’re more protected. Another option is to leave a vehicle at the end of your ride so you don’t have to pedal back on the road. Bike Newport provides a shuttle service to help ease the logistics. On this particular day, the wind was cooperative, so we started this route at the northernmost point of Otter Rock. We parked at Devils Punchbowl State Natural Area and headed down the wooden stairs to the beach, where Otter Rock is a beautiful backdrop to a gem of a surf break. 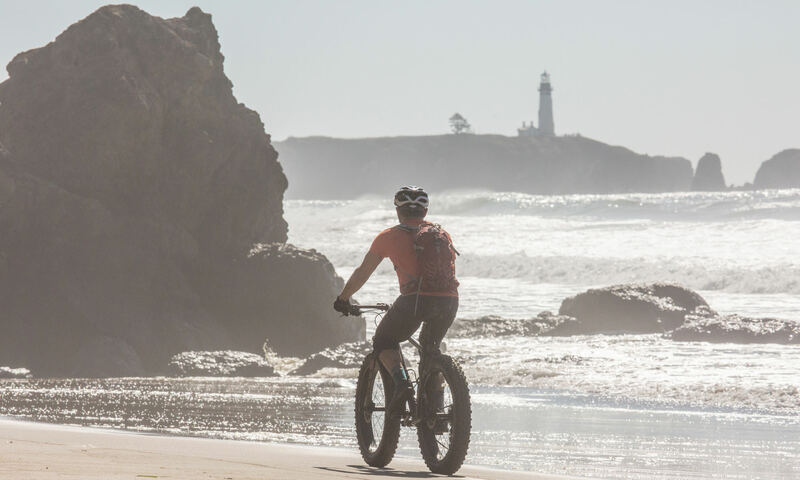 As we pedaled south along the sandy bluffs, we crossed a few small streams, found lots of uncombed beach life and saw the Yaquina Head Lighthouse in the distance. 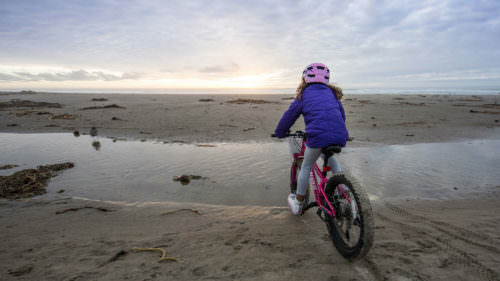 It’s important to do this ride during the lowest tide possible because we worked our way past different rock outcrops and it was easier to ride around them when the tide was out. Even still, as we got closer to the lighthouse the water around Yaquina Head was much too deep to ride through and if we stayed on the beach we would have run into the cliffs. We got off the beach to ride Highway 101, the Pacific Coast Scenic Byway, for a bit. The best spot to pull out is at Moolack Shores Motel. On the highway we climbed up and followed signs to the right to enter Yaquina Head Outstanding Natural Area. This was a great place to take a break from the bike and enjoy some beautiful views. You can visit the interpretive center, join a ranger-led lighthouse tour or explore the various viewpoints. 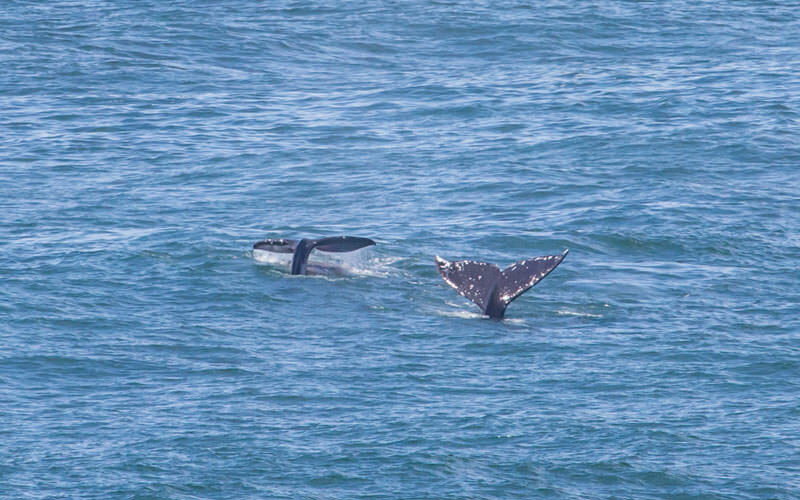 If you’re lucky, you may even see whales passing by (generally in the winter and spring months). When we were ready, we jumped on our bikes and headed back out toward 101. Immediately before we hit the highway, we took a right on Agate Way Road. This dead-ended at a path leading to a staircase that brought us back down to the beach. We continued our ride south, exploring the beach, all the way back to Newport. For an added bonus, you can make your way to the jetty, climb the rocks and capture the views of the inlet and Newport Bridge. We closed the day with a celebratory beer and dinner in downtown Newport. Don’t have a fat bike? Not to fear, Bike Newport has you covered. 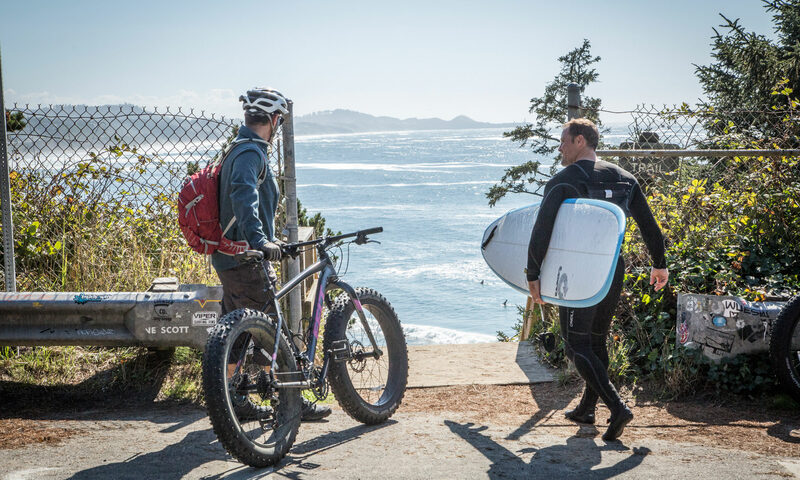 Nye Beach Cafe: Look no further for the perfect spot to grab a healthy breakfast to properly power a big beach ride. Nana’s Irish Pub: Treat yourself to a post-ride feast at this classic Irish pub serving everything from fish and chips to black and tans. Sylvia Beach Hotel: This one-of-a-kind hotel sits on a bluff overlooking the ocean with rooms themed after famous authors and books. The Drift Inn: More than a hotel, this place is a destination with a satisfying restaurant menu, live music every night and charming rooms. 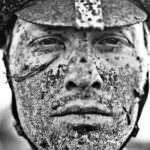 Dylan VanWeelden is an adventure photographer who focuses on exploring the expansive outdoor experiences that Oregon has to offer. 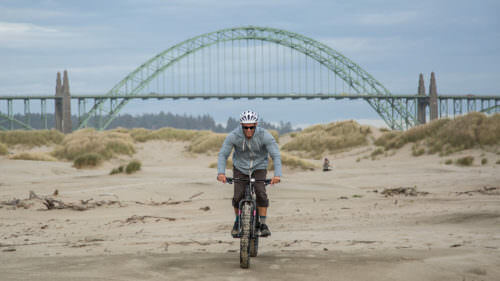 Keeping Portland as a home base, Dylan's travels take him all over Oregon with the bicycle as his main tool for adventure.